Buy your Frozen on Broadway tickets before going to New York. Purchasing your theatre tickets online will save you time and money. Disney’s snow queen Elsa, her sister Anna and their snowman friend; Olaf turn New York City into the Kingdom of Arendelle.. They’ll take you and your children on a magical journey to their world of snow and ice. Frozen, the musical is based on the famous Disney movie, of the same name. It is also the ninth Disney musical to be performed on Broadway at the Disney theatre. Book your tickets for Frozen before you travel, and enjoy mega hit ‘Let it Go’ with the entire family. Buy Frozen tickets now, pay no service fee and pick up tickets directly at the theatre! 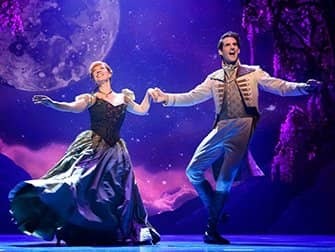 Special offer: 48% off select tickets for Frozen on Broadway, until the 30th of June! It’s easy to buy tickets. Above, select the date you want to go. You’ll then get an overview of available tickets. You can choose how many you want, add them to your cart and pay right away. After paying, you’ll receive a confirmation and your voucher by email. Exchange the voucher for tickets at the theatre, on the day of the show, at least one hour before the show starts. Send me an email at eric@newyork.co.uk if you want to book for groups of 20 people or more. Eric’s Tip: Because all the well-known songs from the animated movie have successfully made their way to Broadway, you’ll have a hard time not wanting to sing along! 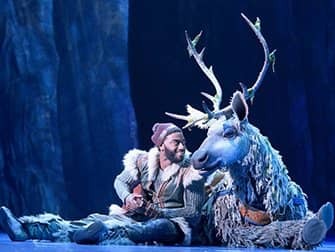 Frozen is definitely a musical for families who want to experience the magical icy world of Arendelle.